It’s CES time! That’s right folks, nerdkind from around the globe descend upon Las Vegas this week for the annual Consumer Electronics Show. Every year CES brings us a bevy of new tech, from mobile to gaming to crazy kinds of media, waiting to be snapped up and fawned over by the masses. Now unfortunately I’m not able to be there myself because my job description doesn’t have a bullet point that says “go to CES and see awesome things.” But I can do the next best thing. Through all the coverage and videos and liveblogs I can still see everything that’s going on, and show you fine folks what I thought was cool. Day 1 didn’t disappoint, and of course provided toys needed to fight the war for your living room and the war for your mobile life. We’ll start with the living room first – which is nothing without a TV. We’re at an interesting time in television tech – after the big push manufacturers made with 3D sets I’ve never really seen them take off. And to be quite honest they’re really not all that impressive. Manufacturers seem to agree, and are going in different directions to try to sell more units. They’re making them smart, they’re making them big, and they’re making them super sharp. Samsung and LG have finally brought OLED (organic LED) tech to larger 55” screens. OLEDs are awesome because it takes backlight out of the picture, making the blacks purely black – giving the user better black level and picture. Not to be left behind, Sony unveiled their Crystal LED TVs today – something new that runs on completely different tech. They showed off sets featuring 6 million crystal LEDs that give brighter and crisper color, and at the same time have a response time 10 times faster than traditional LEDs. So the result? Super thin screens with super sharp images. The OLED TVs will be available later this year, while Sony’s Crystal model is still a prototype. You can see a side by side LCD / Crystal LED video on Mashable and see for yourself. Like I said though, the TVs weren’t just about pretty faces. Vizio introduced TV models with a Chrome browser and VIA (Vizio Internet Apps) and built in Google TV. Samsung went the same route, partnering with DirecTV to provide a boxless, minimalist TV experience. Both with some slick design. Next came the strike on our mobile world. While tablets are flying off the shelves, from king iPad to Amazon’s Kindle, consumers are more and more beginning to adopt mobile solutions for videos and music. But for me I’d rather have a mobile unit that can do more. something with a keyboard and hot specs that can do everything i need to do. something… ultra, perhaps? More than the much anticipated Nokia Lumia 900 and Verizon’s 4G LTE hotspots, “ultrabook” seemed to be the phrase of the day when it came to mobile. Dell, Lenovo, HP and Vizio all introduced light, powerful and super thin mean machines, entering the fray against the Macbook Air. Adopting the philosophy of “thinner, lighter, faster” and ditching plastic for aluminum and carbon fiber, these machines don’t sacrifice weight for performance. Packing solid-state drives, gorilla glass for strength and processors up to Intel i5’s and i7’s each of the devices provide almost instant-on. 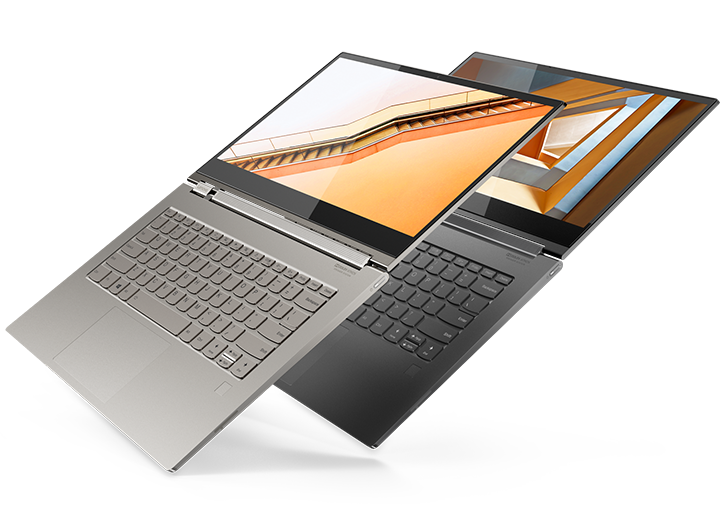 Still, with how cool the Dell XPS 13, HP Envy Spectre and Vizio’s offerings are, Lenovo’s IdeaPad YOGA caught my eye with its design. With a 2-hinge edge, it can be flipped to function as a 13” tablet, and has been confirmed to come metro style with Microsoft Windows 8 – not to mention a 10 point capacitive touch screen. While those ultrabooks were coveted by CES gamers, it wasn’t the only thing by a longshot. Possibly the coolest device at CES today was Razer’s Project Fiona – which turned out to be a tablet with some weird flightstick style functionality. Razer really set us up for this one, dropping teasers that Project Fiona was going to be gaming in an all new form factor. Well, here it is. Funky, isn’t it? Project Fiona is a 10.1” tablet with what looks like 2 PlayStation Move-style controllers on the side. It’s not lacking in specs either – it will have Intel’s Ivy Bridge Core i7 and have the ability to play full PC games. Razer plans to release Fiona toward the end of 2012 with Windows 8 for the touchscreen interface. That wasn’t the only toy that brought with them though. The PlayStation Vita also made a splash for gamers, with Sony announcing AT&T data plans for next month’s release. But there were no hardware changes from the version foreign to our shores. So that’s what I thought were the highlights of day 1. I’ll be back tomorrow to see what day 2 has in store for us in the deserts of Nevada. Speaking of TV’s, I noticed you mentioned the new “boxless TV” from Samsung. I agree that there are new ploys to keep consumers interested and I bet Samsung is hoping some hock shops will be filled with “old” 1080p Smart TV’s that don’t have the integrated connectivity with DirecTV multi-room DVR systems. I personally don’t see many people jumping on THAT bandwagon, however I do see people (slowly) ending up with those TV’s who don’t already have one of those new fangled HD TV’s. I doubt though that those DirecTV customers are aware that giving up their HR DVR receiver means less recording capacity with fewer DVR’s to share. Also, they can’t add an external hard drive to their HR receiver they have left since DirecTV forces a hard drive “replacement” of the existing capacity. That’s why I am more interested in the new Hopper from my employer DISH Network because the hard drive is an add on, as well as it has 50/200 hours more of HD/Standard definition recording time than the HR34. In addition, the “Joey” that replaces a receiver is smaller than an external internet modem.